In looking at the new F1 cars for the 2008 season, two areas stand out as receiving a great deal of attention from the designers: the front wing components and the radiator intakes. We are told that the cars get ever narrower and sleeker at the rear but this is hardly noticeable, whereas the front wing becomes ever more obviously complex and convoluted. It is interesting too that the radiator intakes are assuming apparently identical shapes on all the cars. Each season brings smaller openings constrained into roughly triangular shapes while the bodywork around the sidepods becomes ever more deeply undercut. Clearly, the intakes are a major influence on the aerodynamics of the car and cause a great deal of work to optimize airflow in and around themselves. We may think that this is a new discovery but, in fact, at least one designer was considering the problem way back in the mid-seventies. Brabham's chief designer, Gordon Murray, had a passion for making one element of the car perform two tasks and he decided that the radiator itself was obsolete and that its job could be done by something else. This made good sense for the radiator causes a great deal of drag, the flow of air being disrupted and slowed as it passes through. Designers seem to have accepted the inevitability of the radiator now but it really is a creature from the prehistory of motoring, a simple arrangement of pipes being cooled by the breeze. Murray's solution was brilliant in its elegance and simplicity. Why not, he thought, use the body of the car as a heat exchanger, allowing the flow of air over the skin to draw heat from the engine coolant passing underneath? 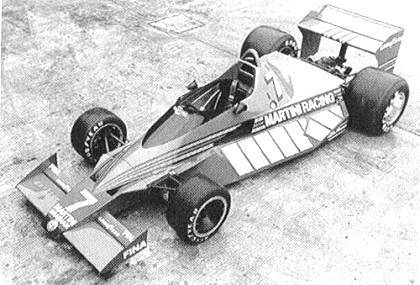 The result of his thinking was the Brabham BT46 of 1978, a car so far ahead of its time that many of its innovations were to fail, only to re-appear in the future. Much of the BT46 was built of composite material rather than the aluminum sheet common at the time and it was the first to employ engine metrics. No radiators could be seen but, at the rear, the bodywork was covered in white rectangles - the heat exchangers of Murray's bright idea. Sadly, in testing the car overheated obstinately, proving that the exchangers were just not up to the task of replacing the humble radiator. In the end, Murray had to insert conventional radiators in the front wing of the car and that is how it raced. The dramatic and sleek shape of the car was largely retained, however, and it remains one of the most beautiful F1 cars ever. Although the idea of dispensing with radiators seems to have become part of history, I wonder whether its time has yet to come. Heat exchangers were insufficient for the purpose in the 1970s but it may be that technology has now produced materials that are more efficient than any available back then. We understand fluid dynamics so much better now as well. Is it impossible that some bright engineer might realize that the heat exchanger's moment in F1 has arrived at last? At one stroke, all those problems around the radiator ducts would disappear and gone would be the drag of radiators impeding the airstream. Suddenly the sides of the bodywork would become free for the aerodynamicist to shape as he pleased. Sidepods might disappear altogether, just as they did in Murray's design. Perhaps the greatest claim to fame of the BT46 was that it became the basis for the "fan car", another idea that used one thing to perform two purposes. The fan might have been necessary to cool the radiators moved to the rear of the car but it did a pretty good job of sucking the car on to the road as well. And that was not a new idea; Jim Hall had done it with the Chaparral 2J in 1970. So Gordon Murray was merely re-introducing an idea that had been outlawed by the regulators of sports car racing once they saw how effective it was - for one GP, the Swedish, the fan's moment had come. Inevitably, the governing body had a hasty meeting and decided that the fan car contravened the rules. In contrast, there is nothing illegal about heat exchangers - they just didn't work as planned originally. But maybe they could be a lot more effective now; maybe it is an idea still awaiting its moment and, incidentally, its chance to show that the FIA have not yet managed to kill off innovation in F1 entirely. I would think that the technology is there for a more efficient heat exchanger. I wonder if anyone is working on this. The design of a car without a radiator would certainly be more streamline. It would look more like a bullet without the sidepods. I have read about surface cooling but have never seen a picture of the car before. I must have seen in 1978 but I read an article about surface coolin a few years ago and don't remember anything about it before that. Typical of Gordon Murray to do something so different to anyone else. I read an interview with him a few months ago and he was asked about the fan car. The rules at the time meant that the fan primarily had to be for engine cooling so it was set up so that 55% of its output cooled the engine and 45% sucked it to the road. I always thought the percentages were radically different. The car was legal and was never actually banned. FISA had a quite word with Bernie and Bernie withdrew it. Murray said that this was the moment he realised Bernie was more interested in running the sport than competiting in it. Odd really consdering that they didn't win their first championship for another three seasons. Very interesting, Steven - I always thought that FISA just banned the fan outright after letting it win one GP. But it did strike me at the time that Bernie seemed to give up without a fight. I presumed that he and Murray had cooked the fan idea up just to demonstrate to FISA that Lotus were getting away with an illegal idea with their ground effect 79 model. Which is a very expensive way to make a point, come to think of it. The point being, of course, that neither the fan car nor the 79 would work without skirts; and skirts, being movable aerodynamic devices, were definitely illegal. Murray's comment about Bernie does sound a bit like hindsight to me - although it may have been the first time he realised that Bernie had other priorities than just being the owner of a racing team. given the current limitations on engine development, it seems unlikely that this could happen right now. however, if a brand new engine concept appears in five years time, then it's not out of the question. what would happen in the heat of bahrain though? You have got what you wish for Clive in the form of KERS. Where Gordon Murray's idea "only" gave a new way to dissipate heat, KERS is going to use it back to power the car. To quote your own words; "Gordon Murray, had a passion for making one element of the car perform two tasks" and KERS will follow this fine line of thought. Sidey: I doubt very much that the radiators are covered by the freeze on engine development - Alianora will no doubt be along in a while to set us straight on that one. It would be a shame if they are, however. Races run in great heat, such as Bahrain and Malaysia, are part of the game and any F1 technology has to pass that particular test. If heat exchangers are ever to be used, they will have to be up to the task - hence the need for considerably more efficient exchangers than were possible in the seventies. Actually, KERS does not meet Murray's criteria, Uppili. It is an addition that performs a task not existing at present, whereas the idea of heat exchangers was that an existing component, the bodywork, could perform its original task and function in another role at the same time. This would allow the conventional component, the radiator, to be dispensed with entirely, thus providing benefits in reduced frontal area and drag. KERS will inevitably add to the weight of the car and this must be offset against any performance gain that it provides. Although modern F1 cars start out lighter than the regulations allow, ballast is added to bring them up to the necessary weight, this also enabling the engineers to alter the weight distribution according to where the ballast is placed. So, even though the addition of KERS components will be easily absorbed in terms of meeting the weight requirements, it will reduce the amount of ballast that can be added and so will limit the effectiveness of changing the position of the ballast when adjusting weight distribution. The heat exchanger, in replacing the radiators, will not be adding weight to the car and might even assist the designers when considering weight distribution, since he would be able to choose where to place them. However, Article 2.5 of the Technical Regulations 2008 say that "novel technologies not specifically covered by the regulations... ...will only be admitted until the end of the Championship in which it is introduced. Following this the Formula One Commission will be asked to review the technology concerned, if they feel it adds no value to Formula One in general, it will be specifically prohibited." Apart from the dodgy sentence length, this would make introducing heat exchangers of dubious value - unless, like Murray with the fan car, there is enough short-term benefit to make it definitely worthwhile. Interesting thoughts, Alianora, and thank you for the information on the letter of the law. I think the point of the sentence is to give Max the power to ban anything that threatens to turn F1 into a one team championship. Had it existed in the past things like turbos and ground effect could have been banned. And we thought innovation was a big part of F1. I guess the message is innovate but do it in small steps so no one notices. A bit like the VW beetle. After the first year of its existence the engineers had compiled a substantial list of improvements. These were made two ro three at a time over a 30 year period. Minimise the cost and convince people you are constantly improving. Good point, Steven. I noticed the loophole in the regulation where it states "novel technologies not specifically covered by the regulations". That is a matter of opinion, of course, and enables the FIA to deem anything new as covered by one facet of the rulebook or another, thus giving itself the power to ban things mid-season. Exactly this happened in 2006 when the mass dampers were banned by considering them movable aerodynamic devices, which they patently are not. The intent of the rule is clearly to protect new ideas from being declared illegal before the designer has had any benefit from his ingenuity and hard work but, since the FIA decide whether any innovation is covered or not, the rule has no effect whatsoever. Makes you wonder why they didn't use that rule to ban the bin lids that eveyone is putting on their wheels. All those environmentlly unfriendly wind tunnel and CFD hours to develop something utterly pointless. It couldn't be because Ferrari invented them?? I thought the rule was there so that the FIA could stop anything really new from being on the cars for too long? Before the rule was introduced (in 2004, if I remember correctly), any device that had been on the cars for more than a certain period that didn't specifically breach one of the rules could be protected by the fact that it had been there for ages - unless the FI(S)A was in one of its more dramatic moments or most/all the teams agreed with each other to ban the item. You're probably right, Alianora. But it amounts to the same thing in the end - the FIA can ban whatever it wants whenever it wants! It certainly is. I just keep hoping that Max will go and a really good president be elected. Hi guys. We have too many high sounding words, and too few actions that correspond with them. I am from Liechtenstein and know bad English, please tell me right I wrote the following sentence: "Offers affordable positioning search engine optimization seo services, seo copywriting, web copywriting, press release graphic design houston texas services for.The seo fox is a full service company in houston, texas specializing in natural search engine optimization, search engine marketing, ppc management." Thank you very much :-(. Ingram.